I have always kept a place in my heart for philanthropy. Evidently food holds a piece of my heart as well, thus when I was informed of a way to combine both passions, I jumped on the opportunity. Taste of the Nation is a yearly event, where restaurants and food shops join forces to raise money, to feed hungry children. Chefs Allen Susser and Timon Balloo, led the South Florida portion, hosted at the Loews Miami Beach hotel. Well-known restaurants in Miami and Fort Lauderdale, showcased items from their menu and guests were able to taste, for a flat rate entry fee, all in support of the cause. 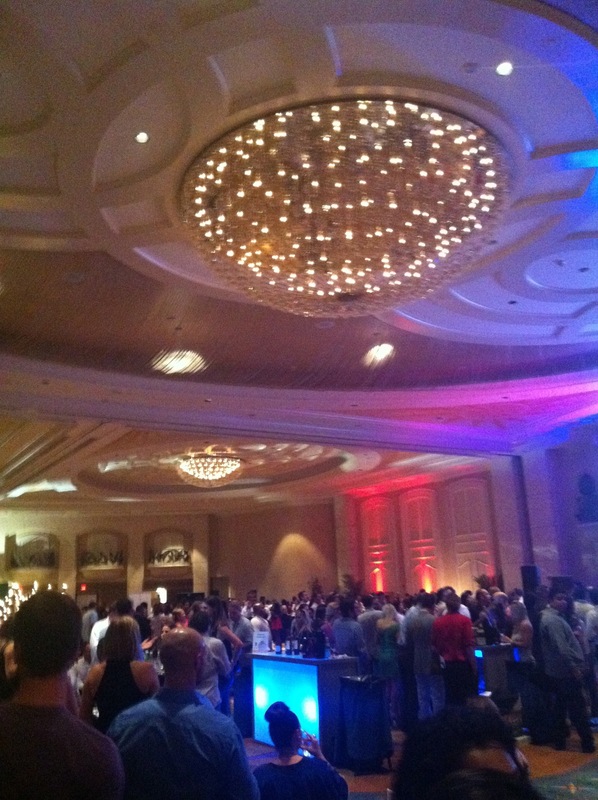 General admission was priced at $125; however, I obtained a discounted ticket from Gilt City Miami at $75. Go Gilt! The event was well organized and the venue was ideal. Loews offered a large banquet room where over 50 restaurants were set up in a circular format around the room, with a few islands at the center, primarily with drinks and desserts. There was also a stage at the front of the room, with live music, and space for speakers as well. J’avais l’embarras du choix! With so many tasty treats to sample, and a glass of wine in hand, constantly being refilled, I felt as if I needed an assistant or a second pair of hands to help juggle it all. But no complaints, being overwhelmed by fine foods is a good problem to have. A memorable drink stand was Madeira, showcasing Sangria and Moscato, served with fruits. I found the Moscato evidently sweet, but not overpowering, and perfect for a girl’s night in. 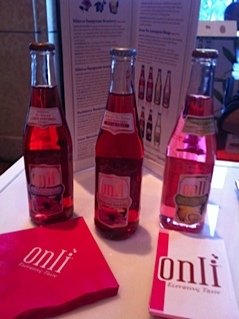 In addition, I fell in love with the fruit sodas from Onli, particularly the pomegranate & strawberry. The drinks are light and Onli also offers the option of unsweetened flavors. I also enjoyed the Sancol Prosecco from 7 Import & Export. It was easy on the palate, but not too airy, yet affordable enough for casual day drinking. I will begin with some of my favorite dishes. I must first warn you that with so many flavors, my descriptions may be short, which only reinforces how much I enjoyed the event and supported the cause. Also, my stomach did not allow me to visit all stands, but again, it was a pleasure. The 50 Eggs Inc. stand, showcased Yardbird and Swine, Southern cuisine, as well as Khong River House with a focus on Northern Thai cuisine. I sampled a spicy Northern Thai sausage topped with housemade crispy pork skin. 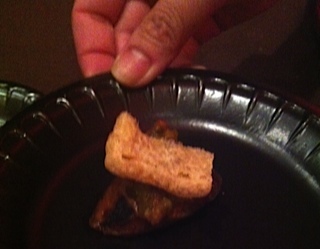 The sausage was oh so juicy and the pork skin was like a chip with pork flavor. It was not overly fattening and despite the amount I ate that evening, it will forever be remembered. 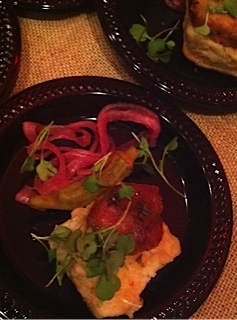 Meanwhile, Yardbird presented a country fried pork shoulder, over a buttermilk biscuit, with picked red onions served on the side. The shoulder was perfectly toasted and the biscuit, as one of the best in South Florida. Yardbird has successfully presented quality Southern food and portrayed it as fine dining, as it deserves; something unaccomplished in Miami in the past. In reference to comfort foods, the Daily Melt stand was a pleasant surprise. 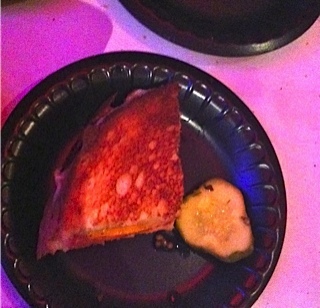 I tasted a grilled cheese sandwich, with truffle oil, butter, provolone and cheddar, accompanied by a slice of pickle. It was grilled cheese done right! Now I know how to satiate my melted cheese cravings. 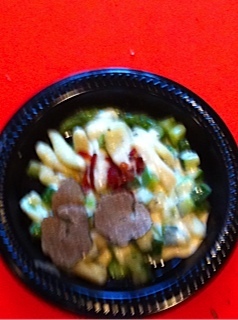 On the truffle note, Dolce Italian dressed a creamy parmesan cavatelli with truffle shavings. The dish was also accompanied by asparagus and the portion was surprisingly large, provided the setting. Again, no complaints. I finished the plate and made a note to visit the restaurant soon. As simple as it may have been, the pasta was fresh, comforting and creamy to the perfect extent. My next stand was Little Palm Island from the Keys. 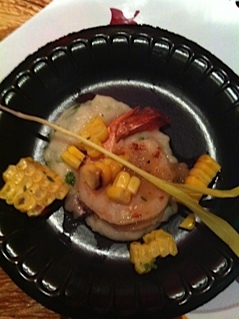 They served a poached shrimp with boniato mash, sweet corn salad and a roasted red onion vinaigrette. I cleared the plate quickly, especially as it was served warm. The potatoes were very smooth and the sweet corn effectively balanced the dish. It definitely encouraged a trip to the Keys. Oak Tavern made me love bacon again! 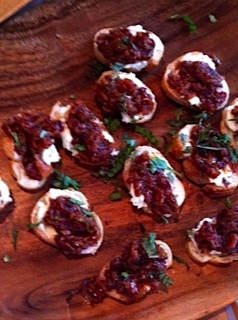 The bacon marmalade crostini, with hints of rogue blue, immediately woke up my taste buds. It was juicy, yet sweet and salty. This is where bar food and fine dining join forces! On a lighter note, sushi lovers rejoice! Zuma served a seared salmon shashimi with caviar, which blew my socks off. The salmon was outrageously smooth and naturally sweet if I dare say. Speaking of sweet, Wynwood Kitchen & Bar offered shrimp ceviche with a pineapple coconut sauce, yielding to a refreshing and sweet kick. It was the perfect transition to dessert. Susie’s Scrumptious Sweets was one of my favorites stands in general, not particularly in the dessert category. 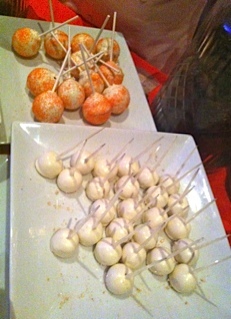 They artistically crafted a key lime cheesecake and a chocolate cheesecake in mini popsicles. The chocolate was decadent, but the key lime was sublime. The surrounding icing complimented it very well and the filling’s acidity was perfectly achieved, as key lime pie often runs the risk of an overly sour taste. I was pleased. Susie’s also showcased a larger red velvet cake popsicle; however, it was not as moist as the cheesecakes. Although I enjoyed all visited stands, some items were less favorable. The Federal shared crawfish and grits with corn. The grits were very creamy, but unfortunately, the corn overpowered the dish and the presentation took away from the fine dining experience. 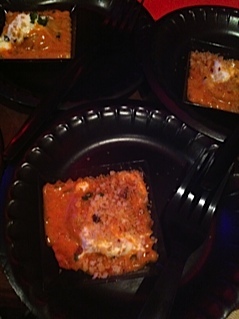 Bianca at Delano, offered veal ravioli, artfully plated for the event and sprinkled with breadcrumbs. Despite the presentation, the sauce was highly acidic, which reduced the dish’s enjoyment. 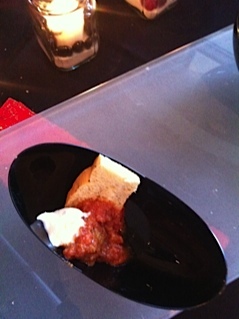 In addition, The Palate Party served Angus beef meatballs with whipped ricotta, picked garlic and a crostini. I find that the dish was not fit for transport, thus the meat and crostini’s texture were negatively affected. In short, it was mushy, and the sauce was quite mild. 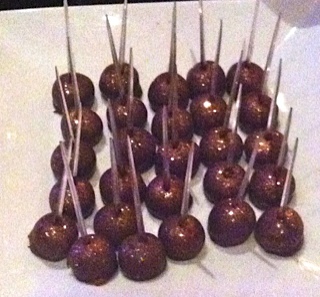 Nonetheless, I enjoyed the event quite a bit and only left due to the limited capacity of my belly. 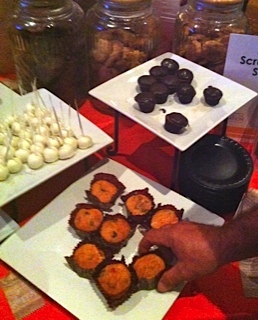 I was proud to be apart of a soiree, raising money to feed the hungry, while satisfying my palate and curiosity alike. I applaud ALL participants for their efforts and generosity and look forward to next year’s Taste of the Nation South Florida. In the meantime, I will be planning visits to some of the aforementioned restaurants. – Also, please follow the blog. You will be the first to know when a new article pops up!